With a change of coach, comes a line drawn in the sand. Scotland are now in the Vern Cotter chapter of their annuals; they were meant to attack this championship with renewed gusto but instead they have that cloud of déjà vu hovering above them. Three lines from Margaret Atwood's 'A Morning' are horribly pertinent. we knew we had been there before." It is a familiar scenario: three games into the championship, no victories. They lost at home to their perennial Wooden Spoon adversaries, Italy. The panic we have seen in the past as they attempt to close out a match has reared its ugly head. 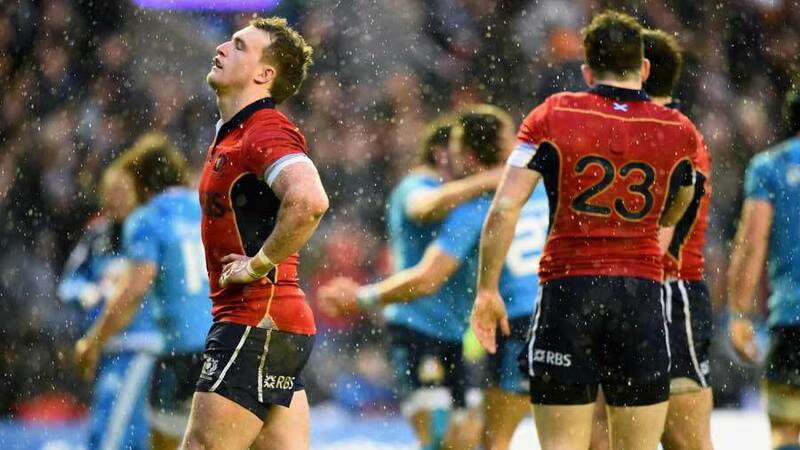 The stars seem aligned against them: Finn Russell was suspended and the talismanic Richie Gray is crocked. Even the handymen of Murrayfield are back on the beat - they must have thought the eradication of the pesky nematodes which plagued the turf last year had given them some breathing space but instead they had to fix the smashed door of the Scotland coaching box. With sustained failure comes a call for change. Talk of ending the closed-shop of the Six Nations and allowing the Georgia's of this world a chance to sup off the top table will be murmured in the bars across England, Ireland and Wales. But thirteen points is the meagre collective difference between Scotland and their three opponents to date -15-8 to France, 26-23 to Wales and 22-19 to Italy. "I still think there's a lot of growth, things have gone forward. We've just got to address a couple of simple things that will have us change and control outcomes better and those are things we'll have a look at internally," was Cotter's take on those marginal losses; the 'what ifs?' burn brighter as a result. Despite being zip from three, there is a quite optimism north of the border. It comes down to 'small margins' and talking to three former Scotland internationals, they retain hope the national team are on the right path. "There's no need to panic," is ex-Lions and Scotland lock Doddie Weir's take when speaking to ESPN. "Scottish rugby has improved dramatically since Vern arrived. They have more direction and structure. Scotland are creating more chances than before. This is the best I have felt about Scotland for a while." "To improve the standard of the national team you either import players with Scottish grandparents, increase the number of project players like Josh Strauss or increase the number of schoolchildren playing rugby. That won't happen quickly"
Craig Chalmers, who made 60 appearances for Scotland between 1989 and 1999, also sees reasons for optimism. "The first three games have been positive: the way we played and the way we tried to play," he told ESPN. "It's a young team and they are trying to play the right style of rugby. There are more positives than negatives. The guys have to start winning and with that comes confidence. Vern Cotter is the right man to install that into the team. We have a good future ahead of us." The improvements required to take Scotland to the next level fall in the short and long-term categories. The immediate priority seems to be to eradicate the errors in Scotland's game with Peter Horne's missed kick to touch at the end of the match against Italy indicative of the setbacks the team cannot afford to concede. The need for clinical precision is paramount. "If you don't kick the ball out of play and you don't stop the lineout at source, you will lose the game," was ex-Scotland and Lions flanker John Beattie's take when talking to ESPN. "There's no excuse for those little margins. It was the basics; they are fundamentally huge things." His sentiments are echoed by Weir and Chalmers. "We weren't clinical enough, it's about fine margins," Chalmers said. "You have to take your chances, the guys must learn to win. In four years time they will be more experienced and that is something we are missing. I don't think the likes of [Ross] Ford and [Greig] Laidlaw are doing enough talking. [Stuart] Hogg should have taken that ball off Horne for the last kick of the match against Italy. It is little things that are letting them down - composure, accuracy and discipline." Weir added: "What is lacking is the clinical precision. And by that I mean - how to finish a game and how to understand what one needs to do, what is important and what isn't. There have been areas of hesitancy or wrong decisions at important moments. It is silly lapses in concentration that is stopping them winning games." Alongside those more immediate factors which need to be settled is the bigger picture. 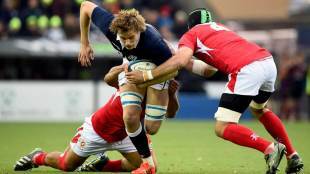 Scotland boast just two senior sides - Edinburgh and Glasgow. Italy are in a similar boat with Zebre and Treviso. As both are finding to their cost, when a mainstay in the team goes down, it is hard to draw a like-for-like replacement from their pool of contenders. Beattie feels there are three options for Scotland to correct this but such changes will only come into play in years to come rather than in time for the next World Cup. "Scotland is still looking to expand and at the moment we don't have huge numbers. The game is bigger in Ireland and Scotland than England. Scotland have more meagre resources and at school level, they play less rugby. So to improve the standard of the national team you either import players with Scottish grandparents, increase the number of project players like Josh Strauss or increase the number of schoolchildren playing rugby. That won't happen quickly." You expect such thoughts of restructuring - why Scotland don't have a team in the Borders, the traditional stronghold of Scottish rugby is mystifying - are very much on the Scottish stakeholders' minds but the immediate focus is on this Six Nations and the World Cup. 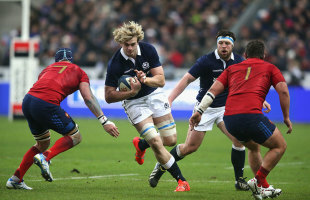 The loss of the fantastic Richie Gray is being felt but there is little they can do about that. The Glasgow contingent offer reasons for optimism with Gregor Townsend's fingerprints all over the superb Mark Bennett and Alex Dunbar. With England up next and the chances for players to put forward their claims for a World Cup spot, Chalmers would like to see a change in selection and captaincy. "We miss Richie Gray and David Denton. We need more ball carriers; I feel Kelly Brown still has so much to offer. Blair Cowan has done a good job, he's industrious. He's no John Jeffrey but he's a decent player. I'd like to see Chris Cusiter back in the squad; Laidlaw slows things down. He's not quick over the ground and I'd like to see Cusiter working in the squad alongside [Sam] Hidalgo-Clyne. The captaincy should be given to Jonny Gray. He's calling the lineouts and England backed a young Will Carling so Scotland should do the same with him." Beattie wants to see an increase in intensity in the Scottish game with the gameplan altered to dovetail with the two PRO12 sides' tactics. "Glasgow and Edinburgh play with a simple shape, Scotland sometimes over-complicate it," Beattie said. "I hope they go for the England pack. If you are going to beat England you have to wham into the forwards. You get their big guys on the deck. They need to speed up the scrums and lineouts. They are big anaerobic animals. I would speed everything up with quicker scrums and maybe quick-tapping penalties." Pondering those tactical nuances will be Cotter, the man Weir labels their "modern-day Jim Telfer". Up next is the auld enemy and the omens aren't great for Scotland as they head to Twickenham. They last won there in 1983, the same year they drew with the All Blacks. "Even when we won in 1983, the previous win was 1971 so we thought that was a long time back then. It's an extraordinary fact. There haven't been many Scotland teams who can stop England," was Beattie's take who started in their 22-12 triumph 32 years ago. But there is a quiet optimism. The message from the three was if errors can be eradicated and an 80-minute performance strung together then they could silence Twickenham. Scotland's rugby scene is a turbulent beast but they are heading in the right direction. Changes will inevitably be introduced as some juncture with the professional side of their domestic game still requiring the odd tweak but the general perception, from Chalmers, Beattie and Weir, is that they are on the right trajectory. Weir is quietly hopeful of Scotland ending that 32-year hoodoo and he sees other benefits than just a win at Twickenham if that materialises. "I'm optimistic they will compete well," Weir said. "If they get their tactical pattern correct, then who knows what might happen. If that happens, I will be able to smile in front of Will Carling." They are a new side, have a new coaching team, but the rivalry is just the same.